Well, I have to say that for as much as the internet is supposed to be a place of news, information, knowledge, communication, and a place to connect…I’m a bit disappointed. In two weeks time, no one had anything to say about my last post. So, I guess I was wrong; you do just want to hear me rant and rave. I guess I won’t disappoint you further. In a post entitled A help for struggling worship leaders, I mentioned that a worship blogger was working on a book, and that he asked worship leaders to give him input on their “greatest challenges”. One comment on that blog was, “…is there a way to determine if people actually worshiped rather than were entertained? My goal is to point them to Christ and help enter into God’s presence, but how do we know if we have been successful?” I alluded that the answer to this question is found in your Philosophy of Worship. Let’s jump in from there. It sounds really complicated and scary when you talk about developing a Philosophy of worship. Let’s face it, so many of us are wondering about what to do, where to go, who to talk to for today; and then we worry about our future and how we can walk in God’s perfect will for our lives, and how to build the Kingdom, and if we’re growing closer to Him or not… Do we really have time to stop and think about, to sit down and “develop” a philosophy of worship? Hasn’t someone written a book on that and given me all the answers, Cliff Notes style, so I can read/memorize them once and move on to the next thing? In a way, yes; the answers are found in the Bible. But are they cut and dry, the um-teen steps to a perfect worship experience? No. You have to be willing to go in and get them, test them, find out if you’re right, and apply them all by yourself. I don’t think it’s because thinks that we loved high school so much we’re going to be in a sort of religious education program for the whole of our lives; it’s because He wants us to know Him deeper, more fully, and more clearly every day. But that doesn’t really answer our fellow blogger’s question, does it? In your Philosophy, after defining what worship is, you should be able to come to a conclusion of what its purpose is. Worship doesn’t exist just to fill time or fill space or give us something to do. It’s not television, it’s a spiritual experience, a supernatural encounter between you and the one true, living God. God didn’t create anything to just fill space. Take a look at Creation itself. The natural sciences tell us that everything works together. There is a food chain, natural ecological systems, natural checks and balances, and countless natural systems that help the earth rejuvenate and replenish its resources. Surely worship, itself created, ordained, delivered, and described by God Himself, has a purpose. And once you have a purpose for worship, you’re giving it meaning. Suddenly it transforms from something rote, automatic, or unworthy of your participation, into a necessary and vital element in your relationship with God. Giving it purpose helps us delineate its distinctives, elements that tell you whether or not you are accomplishing that purpose. This is the first part of that litmus test. Once you have a purpose, you have an end result, a destination of where your worship takes you. 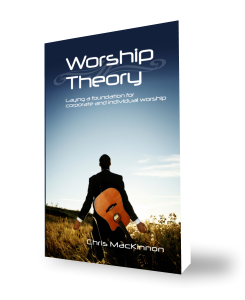 I’ll be posting a short form of my own Philosophy of Worship from my book Worship Theory. In that Philosophy you find that the destination is a “holy of holies” type of experience. My end result, my completion, the determination of whether or not I was successful comes from whether or not that experience is fulfilled. There is one other element we must keep in mind. When it comes to determining whether or not we entertained or actually led people into God’s presence in worship, we can only honestly speak for ourselves. And that is part of the difficulty in worship leading. Don’t forget the two weeks you mentioned contained Palm Sunday, Good Friday, Resurrection Sunday, and perhaps a number of rehearsals and media work-sessions to get ready for those events. You may find people comment a bit more once they rest up from what I believe is the Christian’s most-high-and-holy season. I hope so.